The day has finally arrived, the releases of the long awaited (for the interested) CU and NGE interface modifications for SWG PreCU emulators! The "project", or more like the idea behind the project popped up in Vlock's crazy mind on the 9th of April, 2009. Three years ago. At first, it was simply getting the CU and NGE icons to work on the PreCU Emulator(s), Vlock was pretty determined even after the amount of discontent showed by many SWGEmu members, for obvious reasons I must say. Most people thought this Client side mod was going to be forced onto them once again, but we're no SOE. Surprisingly enough, we saw that many members were actually interested in this modification, mainly those who did not mind the CU, and those who "accepted" the NGE. If one person could help with about anything related to SWG's client, it would be Uli. After Uli showed Vlock the path to success, Vlock went on his merry way and started adding the colored icons one by one, not hard but really tedious. Browsing the SWGEmu in the hopes of finding interesting, I was attracted by the word "Mods", it was calling for me I swear. I didn't take me long to get interested and start my own research, following Vlock in his footsteps, and at the time even the slightest advancement was an epic success for me, knowing absolutely nothing of the SWG Client files. Bugging Uli from every angle, I managed to learn a few basic things to get me started and keep me going. (Pretty sure taught me because I was annoying him lol). The Project was started, and while I was still learning how to mess with the files in every possible way, Vlock had already started getting some great results and a new thread was started. It all started with the NGE icons and cursors, while it was pretty buggy at the time, things looked promising. People started popping up to give Vlock their support... or bash him. The Chat window won't resize! Vlock said. But it does! Look at those screenshots! Uli replied. What's going on?! Kayliaah said, astonished. Vlock still being on duty, and about to go back home, he didn't have the time he wanted to continue working on the mod regularly, and myself getting used to the files, this where I stepped in. A team was born, a small one perhaps, but a team nonetheless. Vlock and I worked hard on our side, communicating in PM's mostly and helping each other, giving each other ideas and ways of making this work, good times I must say. After a while working together, real life called to Vlock but I kept going, nothing could stand in my way. Starting by experimenting with icons, I was learning by myself, and of course by bugging Uli, but who wouldn't bug him. Valkyra talked about the CU interface, saying how cooler it looked etc which got me interested. Still working on the NGE GUI Mod, I was taking notes for the CU one. Finding out that the template Uli gave us to start the mod was a file from the Combat Upgrade, I started noticing a lot of bugs and unexpected crashes, icons not working and misplaced object. The SWGEmu's Object Restructure was just officially announced, this gave me an idea, why not do the same thing? So I restarted from scratch, using this time a legit PreCU UI file. Seeing that simply copy/pasting code wasn't going to work as a lot of code was different, placed differently, in short it was a mess and I was still learning at the time. Catching up with my old work, I was at the same point where I left off, but this time it worked. Then that stupid Radar was bugging me, oh this one was a hard one, this is where I understood that using NGE UI files as a template was going to be a pain in the arse and glitch the whole thing. So I started doing everything from scratch, using only Screenshots as a template, double work, triple efficiency. It worked, I had just added the Teras Kasi icons and I kept going at extreme speed. Having to log on SOE's Test Center to get all the screenshots I needed for the icons, the interface, getting their names, locations etc was annoying, but needed. Some people gave me their personal UI color schemes to add to the mod, and it was pretty cool. I ended up with 33 interface colors to choose from. That stupid Toolbar gave me issues too, the big and useless blue button wasn't there at the time, it started looking like it could work though. Command icons, with Entertainer icons and the such were done, now was the time to work the HAM Window. Thinking I had gotten the HAM bars locked at the same length at the time was foolish, I shamefully managed to do it 3 years later, and the solution was oh so stupid. Quick return of the US Army Scout. Vlock was back and kicking for more modding, worked on the Chat Window which still had issues and managed to make it resize even better. I had made progress on the HAM Window, NGE textures were there and looked in place, still taking notes for the CU GUI Mod. Finishing the Chat Window, and finishing adding the Medic and Doctor icons, I was now trying to find a way to merge the Modifier Window (Buffs) with the HAM Window so the Buffs would be part of the HAM Window but I didn't find the solution until a few weeks later. I was working on the CU and the NGE GUI Mods at the same time, which was a bad idea because it distracted me, then I dropped the CU Mod for later, until the NGE Mod was done. Joshino asked if it would be possible to make a completely new interface using our own textures etc, which got me interested, I took the example of KOTOR (Was re-playing KOTOR 1 & 2 at the time) and explained that it would be totally possible and pretty neat. Got distracted and drifted away to another mod, which would be later called SWGEmu Species Revamp Mod. It had been months, and the first sort of working NGE lookalike GUI Mod was pretty much done, I had done the Radar (which looked pretty bad at the time), and had given my files to Vlock so he could test them at a higher resolution, I wanted to make sure I used the right coords which would match every screen resolution, and not just stay fixed and look retarded. I had restarted my work on the Toolbar, had added everything accordingly, big blue button (still useless for obvious reasons), and everything was working. Chat Window was almost fully skinned, only the tabs were missing, but it worked. Vlock had gone again, I was alone working on the mod, haters kept coming and lovers were still supporting me, was pretty busy with class but still worked on the mod in my spare time. Sadly the thread had run its course as more important matters regarding the SWGEmu project were involved, dramas, Object Restructure and people back to school. I kept working on my own, silently, still getting PM's from people asking me for the release date, which I could not give at the time. Personal issues and randomness of life was hitting me hard but project keep you going, even if they are meaningless to some people. A crazy big system failure struck me, my HDD wasn't damaged thankfully, but I had lost most of my files especially the latest updates which looked promising. Bummer. What to do? I was angry that my backups were too old and that most of my recent work was gone for good, hell knows I've tried getting back those files through restoring programs, without luck. Took a break, many breaks actually, reworked on the mod here and there, now and then, without real purpose. My hands on the keyboard, I was determined like the first day, new goals and support from various members gave me the quick boost I needed in these dark times, with my growing knowledge and my modding mania I took the bull by the horns. I was sure now that I was on the right path, the loss of my files months before didn't matter anymore as I had gone even further than before, I could see the light at the end of the tunnel. Besides, it's not a freaking interface mod that's going to bother me goddamnit! And here we are, fixes fixes and fixes, 3.0, 3.1, 3.2 and now 3.3. Finding new ways of making what I had in mind work, after so long, everything getting so simple while at the time it was even too hard to look at the code. The installers ready, the NGE and CU GUI Mods are ready, now is the time to let them fly. Yet it is the day I chose to release these annoying babies, don't ask why I don't know myself. Thing is, I'm glad it's done, there is so much more that can be done and thankfully we are surrounded by talented people, and Star Wars Galaxies will stay alive because of them. Things do not always look so bright but if you keep going, if you find certainty in your purpose then time doesn't matter. I would like to thank Cain Vlock for starting it all, without him I wouldn't have found this thread three years ago and I probably would puke at the sight of a line of code. I'm glad to have taken over, glad to have been able to polish this modification the way I wanted to, it's not perfect of course, but what is? Uli, the one and only, who helped me so many times, gave me valuable information and fed me with his riddles until I was full, one of the most valuable assets to this project, even if some people now see him as a random hacker because of recent drama, what a joke. To all the others who supported this project throughout the years, to the people who can look at a colorful icon without calling blasphemy, what happened happened, we are not bound to SOE anymore and I think it is time to make peace and do what we want. This modification will change the original (PreCU) interface to resemble the interface from the Combat Upgrade (Patch 15). The mod comes with an installer that will let you pick the parts of the interface you wish changed. to accept the new windows' coordinates, or else some windows would disappear out of your screen. - Colored icons for all professions, commands, macros etc using the CU/NGE icons. - New login screen resembling the Station Launcher login box. - Custom made "OLD PAL" loading screen, with Lando Calrissian in the picture. - HAM window for your character, CU style HAM bars and icons, with buffs and states under the HAM. HAM bars length locked. - HAM window for your target, CU style HAM bars and icons, with states under the HAM. HAM bars length locked. - Group window CU style with HAM, with states under the HAM. HAM bars length locked. - Combat Queue modified to fit under the states of your target's HAM window. - Larger Options window with a new Keymap tab. - 23 new interface color schemes to choose from. - Button bar with colorless PreCU icons which are forced regardless of if you choose the 'Colored Icons' feature or not. - 20% smaller PreCU Cursors for those like me who find the PreCU cursors too big. - Originally made by Anach. Will work with any other SWG Emulator, as long as the servers use Patch 14. 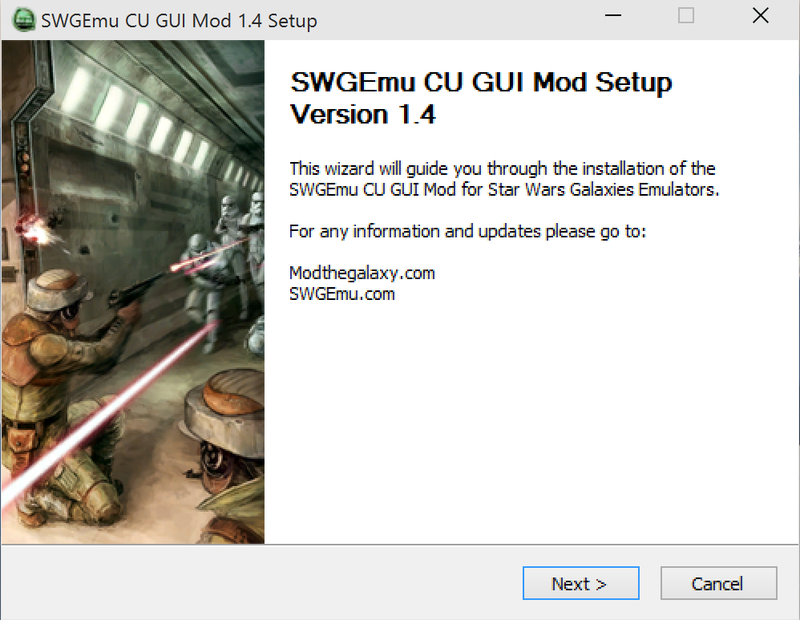 Double click on the "Uninstall SWGEmu CU GUI Mod" link in your SWG Emulator directory to uninstall the modification. Use the /ui hudreset command to reset your interface to default. Feel free to report to the thread you got the mod from for any problem you encounter. This client side modification is in no way affiliated to the SWGEmu team. DO NOT contact them for support of any kind related to this modification, as no support will be given to you. if you're not sure the CU GUI Mod is the cause of your problems uninstall the Mod first and verify if the bug(s) is/are still present. be sure ot use the /ui hudreset command to reset the interface, which will replace the windows accordingly. - To the people who dislike the NGE interface and prefer a 'cleaner' interface such as the PreCU/CU interface (Valkyra for instance) who gave me the idea and got me interested. I've made a NGE interface mod for SWG PreCU Emulators, I had to make a CU one as well. for anything related to them. Use at your own risk! Please ask the respective author for permission to include them in your own work. This modification will change the original (PreCU) interface to resemble the interface from the New Game Experience (Publish 25). Screenshots are provided in the folder accompanying the installer. - Custom made "FASTER THAN LIGHT" loading screen, with Han Solo and Chewbacca in the picture. - HAM window for your character, with NGE skin, HAM bars and icons, with buffs and states under the HAM. HAM bars length locked. - HAM window for your target, with NGE skin, HAM bars and icons, with states under the HAM. HAM bars length locked. - Group window with the NGE style box and HAM, with states displayed under the HAM. HAM bars length locked. - Chat window with NGE skin, fading out on disable. - Toolbar with NGE skin and fake blue button, resizable vertically to a second row. - Radar with NGE skin, buttons and coordinates, added slightly transparent corners to resize the radar more easily. - Combat Queue modified to fit under the Radar. - Button bar NGE style (vertical), with colored buttons and a window which fades out on disable, that displays the button names. - New set of Cursors directly taken from NGE. Install the modification by using the provided installer, select the components you wish and point the installer to your SWG Emulator directory. 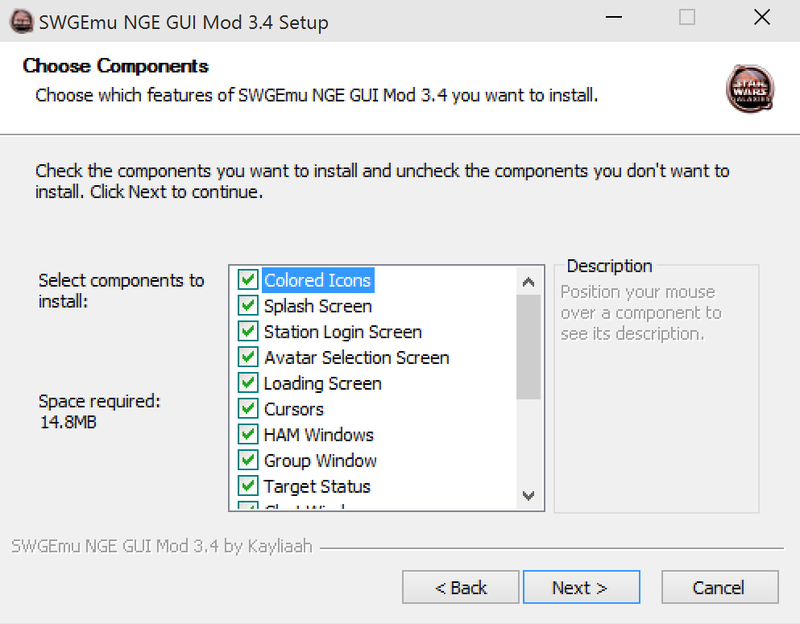 Double click on the "Uninstall SWGEmu NGE GUI Mod" link in your SWG Emulator directory to uninstall the modification. if you're not sure the NGE GUI Mod is the cause of your problems uninstall the Mod first and verify if the bug(s) is/are still present. Uli, for his teachings and riddles, he's always willing to help as long as you are really interested. Vlock, for he is the reason I started this project way back, at the time it sounded impossible to me. DISCLAIMER: The author of these files do not accept any responsibility for anything related to them. Use at your own risk! These pictures might not reflect the exact version of the mods, there are just here to show the look and features of the installers. The pictures will be updated if the installers themselves need to be updated. - The installer for the GUI Mod. - A Screenshots folder containing screenshots for each component/part of the interface, so you know exactly which component you want to select/unselect upon installing the modification. Alright I seem to have found a hotfix to have parentheses working in chat but also having them be invisible on titles and afk/lfg. Used Kay's trick for the font that's used on players and NPCs, but still haven't found how to actually disable them all together for the titles. 1.) You can't have the "Default Chat Box Font Size" on the third setting (See these screenshot: Visible - Invisible), anything before or after is fine. Do not forget to post your comments and report any bug you encounter, thanks! I do apologize for bumping this really old thread, but I MUST answer this question because I also REALLY wanted to figure this out. I know it's too late to help Xacius out with this problem, but I'm here to explain for those who may stumble upon this now, or in the future. The CU mod does not modify the ham bars with any .dds file and Timbab, I do not believe there is such a thing as a ham.dds file, as I could not find anything named that in the texture files. This mod relies on a file named ui_ground_hud.inc - you will find everything you need to edit in here. I took a really close look at this file and found that the HAM bars are color coded in this file with hex codes. Once you find the hex value for each bar (there are 4 spots for each bar) you can change the background color to whatever you want. There will be four for each bar that you have to edit. Simply replace the strings with FFFFFF for a white background. I've uploaded the file here for those not comfortable with editing your own files. Simply drop this file into your ui folder in the root of your SWGEmu installation. It should ask you if you want to replace the existing file if you already installed the CU Mod. If you haven't, make sure you install the mod first and THEN drop this file in there. Hope this helps someone! Sorry to have kept you waiting all day. I really like the login screen on the NGE UI mod, and the new button for "Sign In". I tried new things, making everything as close as possible in the limits of PreCU, and the login screen was part of it, who knows some people might be nostalgic of the Station Launcher lol. Just tried the cu mod out for a little (it's really late lol), looks nice!!! Good job on the hard work mate! Thank you, and nice name. -Might want to change the healstateself icon, right now it's the one that was Force Aura in the CU but I will look at the icons later and try to remember which one it was. Overall though I enjoy it, just need to get used to which icons are which. - Already noted the swimming icon so it'll be in my next update. - What do you mean the Force bar doesn't move? Since for now all the HAM bars are locked at their default size and cannot expand, neither does the Force bar. Does the Force bar have some special resizing feature or something I missed? I'll look into making a double size HAM window for those who want a bigger one. - If you could find which icon healstateselt had it'd be great, I personally haven't found anything only PreCU icons, it looks like it never changed, or I missed it again. I don't even know what Force Aura's icon looks like lol. If you don't find the icon, I'll see which one I can use instead. Answered on IRC, now let's get to work. Thanks to Valkyra for the reports. Good job on the UI. I remember complaining about the CU UI changes when they hit, but I did get used to it after a while, and kinda miss them. However, I never did get used to the NGE UI, and that is what prompted me to make the Pre-NGE UI mod for live. Yeah I know, it depends on people's taste which is why I made this, there are people who came from the CU and the NGE, and those who just want a change, more choice doesn't hurt right? I mean as long as you don't force it onto the player, like SOE did. I must say your Pre-NGE UI Mod is one of the things that got me interested, I remember it was the first mod I ever tried on SWG, and even tried it on SWGEmu before knowing that it would just crash my client lol. Now your mod has come a long way with Caveman's UI Addon Pack, who knows we might get something similar for Mod The Galaxy in a near future, a big compilation of the must have mods that you can choose from, in a big installer. And it's good to have a modder like you lurking around, even if you're not playing on SWG's servers or SWGEmu's server, your knowledge is welcome. Too bad Caveman gets mad every time somebody mentions SWGEmu, he even filtered the word lol. He's not under their command, that's just what you call paranoid, cowardly and retarded. Pardon my french. He's afraid that if SOE find out that they have "links" with SWG Emulator communities, they're going to shut his website down, but I'm sure SOE don't even care about the modding communities anymore. They don't even try fixing the numerous and well known exploits and hacks, no surprise here. Even if they did care they aren't in a position to start lawsuits. The recent studio closures just reinforce that. Maybe not anymore, but ModSource is kinda old and if SOE cared they could've pushed them out stating Client side mods weren't authorized, no need for a lawsuit, you don't go against a big company like SOE even weakened, you acquiesce. Money rules. But we went off topic, my bad. SOE haven't been 'big' in a looong, exactly why they never went for swgemu, in fact they tried claiming it was just a mod at first. And yes, apologies for the thread hijack. I know, yet they said they would hire the Devs who succeeded, I thought it was just a mod SOE? Hello? And don't worry, we're at Mod the Galaxy, we keep it cool. Anyways, back to whatever I was doing before, which I can't even remember. When I handed it over to Caveman, he was very fast to combine our mods. I certainly appreciate him taking over when I left the game to get married. Oh that's interesting, what was the fix about? I thought it always concerned the ground game as the space UI was unchanged, if not for the new icons. I don't get it, those guys at SOE are paid to develop a game, they have all the tools they need and the skills to use them, but it is the player with his or her little hands who has to fix the developers' mess manually. How fun lol. Well anyway it's a good thing you started this UI mod long ago, many people followed your footsteps it seems. Next, a completely new interface, I have a few ideas.